I bought 3 yards of zebra print fabric which was more than enough, some black tassel fringe that was technically for pillows or furniture and some wired zebra-print grosgrain ribbon. We folded the fabric in half and matched the seams of the edges and pinned it in place. On the folded edge, we took a shift dress that I like the fit of and pinned it onto the folded fabric with the neck at the top of the folded side. This kept us from having to stitch the front and back together on all seams and from having to seam the sleeves. We cut the shape of the dress out adding about an inch on all sides to allow for the seams when we sewed it together. For the hood attachment, we used a hooded sweatshirt and, again, just pinned the hood onto the folded fabric. We allowed for plenty extra fabric here to ensure it was roomy enough to attach to the dress. 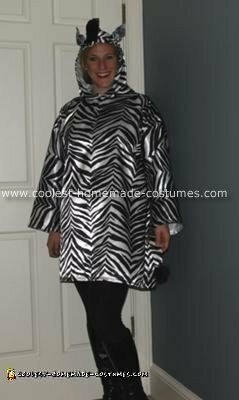 During the sewing process, I would try it on and we adjusted and snipped here and there to get the hood right. I used the wire ribbon for ears and the tassels for the zebra mane and also attached a few to the end of the tail. To make the tail, we sewed a piece of the fabric together inside out so the seam would be on the inside. We then sewed one end of it together, pulled it through and then attached the tassels to one end, sewing the other end onto the dress.